The kitchen is the heart of the home, everyone spends their time here. 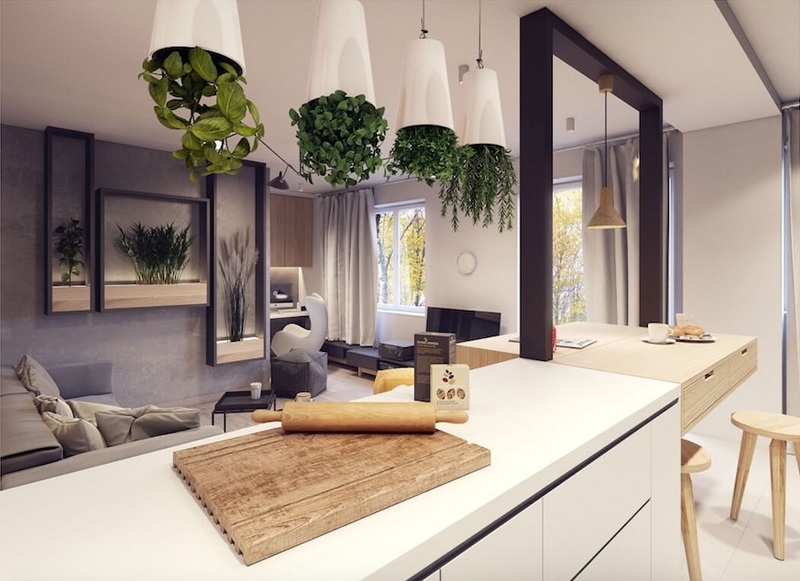 When you have all the design elements sorted for your kitchen like your appliances, cabinets, floors and walls, you're probably wondering how you’re going to achieve that cosy, lived-in look and make it your own, or perhaps you're just wondering how to restyle your existing kitchen? We've listed our Top Ten 10 items that will definitely compliment your kitchen and bring it to life and make you the envy of all your friends who pop over for a cuppa! There are so many ways to arrange your plants, from hanging plants to window sills or even as a centre piece on your counter or dining table. If you’re really green fingered, then a mini garden in the corner of your kitchen will look beautiful. It’s also believed that plants at home increase feelings of calm and relaxation, which we all need! And It’s a great way to ensure your kitchen is always smelling fresh - need we say more! Low hanging lights are a great way to create a mood over a counter while you cook, eat, or just want to chill out. The addition of a striking splash back can make all the difference if you have an all-white kitchen or if you’ve used a few colours in your kitchen. Patterned tiles compliment a range of styles and can be the perfect statement for your kitchen. Yes, you’ve guessed it, this is another opportunity to share our love for copper. Cookware in these colours look super smart and the colours add warmth to a minimal counter, a great way to bring in colour to your kitchen. Just to sway you further, falkculinair.com (these guys specialise in creating professional cookware) say that of all metals, copper is the most effective for cooking and one of the best metallic conductors, practical and pretty! Organisation is key to a beautifully maintained kitchen, I know it sounds boring but these storage hacks from Country Living will have you channelling your inner OCD. Coffee machine just scream sophistication. La Pavoni’s Stradivari antique style espresso machine is certainly a showstopper and available in a range of different metals. 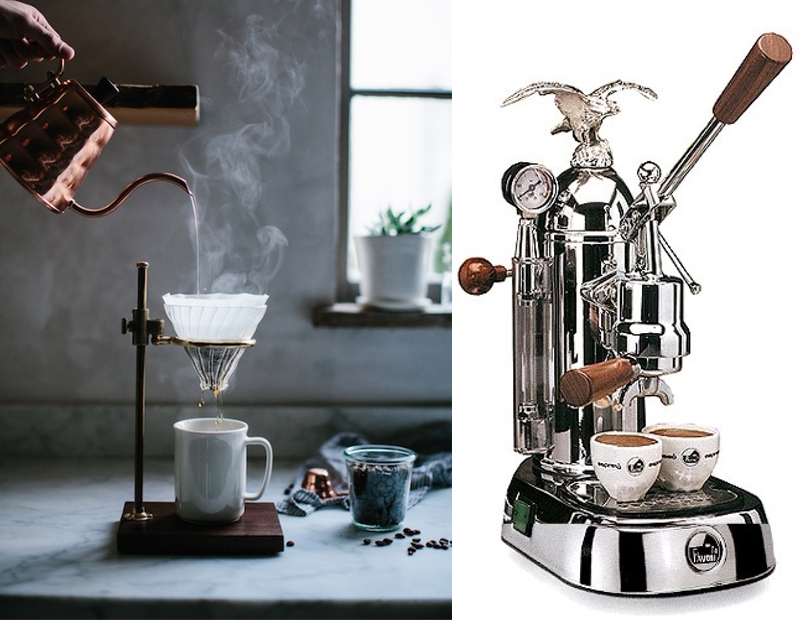 Or, if you’re the rustic and traditional type, a brass and walnut coffee brewer (by Kaufmann Mercantile) is winning, both of these beauties would make an attractive conversation starter. We say yes to both! Tableware in pastel hues look fantastic for any occasion or season. We especially like mixing wooden and metal cutlery - very Scandi! If you’re obsessed with glasses, then a rainbow style collection is a brilliant way to feed your addiction, any excuse for more glasses really! Or, if you like things simple, this COS Range and mercury ombre set will look classy in any kitchen. Artwork is a great way to personalise your kitchen, whether its tongue in cheek or simply cute and homely - its a great way to express your individuality. Whether you're style is eclectic, contemporary or traditional - there’s a kettle for you out there. We’re personally loving most things transparent, so it’s no surprise glass kettles are on our list. Once you’ve styled your kitchen, you’ll need this essential piece of English tradition to show off your lovely kitchen. So put your feet up and enjoy a brew, stylishly of course!